Have You Ever Wanted Your Own Custom Graphics? Just imagine how much better your channel will look after you’ve turned those sweet design ideas that you’ve been coming up with in your head all day, into something real! From custom overlays, to offline screens, to panels, and even your own custom logo, it’s safe to say the people visiting your Twitch or social media channels will definitely take you more seriously once they see your brand new custom designs. 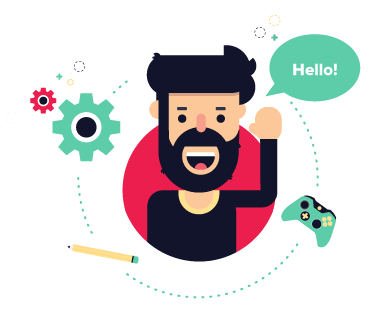 Work one-on-one with one of our professional graphic designers, who’s number one priority is making sure your graphics turn out exactly the way you want it. Keep scrolling below to see how the designing process works and to look through our custom graphics portfolio and styles pages. We design custom graphics for Twitch streamers, as well as Mixer, YouTube, and Facebook streamers! At the bottom of this page we have a form for you to fill out. It’s designed for you to let us know everything about your custom project. The more details you can provide us, the easier it is for us to design your graphics just how you envision them. *Requests with minimal effort in explaining their custom graphic details will be declined. Once we’ve received your custom graphics request we’ll review it to make sure we’re able to help bring your vision to life. If we can, we’ll get in contact with you to further drill down on how you want your graphics to be designed. Based on the info you’ve provided us for your graphics we’ll pair you up with one of our designers who matches the design style you’re looking for. We’ll give you the price for the project, and an approximate deadline for completion. If you’re happy with the price, you’ll pay half upfront, then once payment is received we’ll set you up on our Streamplay Discord with your designer in your own private channel (text chat) to get started on your custom stream graphics. Your designer will stay in constant contact with you throughout the entire designing process. After the project is complete, and you’ve approved the design(s), give your designer a high-five and they’ll send the high quality graphics your way once the final payment has been received. Congrats! You’re now the new owner of a one-of-a-kind custom design/brand. Now go show the world 😉. envisioning your custom stream graphics to look. Ready For Your Own Custom Graphics? Once you’ve filled out the custom request form we’ll review it, then get in contact with you to take the next steps if we’re the right fit for each other. Thanks to everyone’s overwhelming response, we are currently backed up on custom projects and will likely not be able to take on your request at the moment. Sorry for the inconvenience! Logo, emotes, sub badges, and animation options are further down this form. Please give us details on how you're envisioning your graphics to look. Include colors, styles, and references to other graphics you've seen that you like (URL links if possible). Logo prices start at $60 and can get up to $200+ depending on the style of logo. Please go into details on how you want your logo designed. Include colors, styles, and references to other logos that you want to base yours off of (URL links if possible). Is it just a text logo? A mascot logo? Is there a character involved? Things like that. Emote/Badge prices start at $20 each and can go up from there depending on how complex your designs are. Please go into details on how you want your emote(s)/badge(s) designed, and how many of each you'd like. Motion design can add an extra $50-$250+ depending on how complex your animation is. Please explain in detail what graphic(s) you want animated, and how you envision the animation to look. Provide URL links to images or videos that help us see what you're seeing in your head. The more complex your design request is, expect a higher price. We offer package deals for larger custom projects.